There is nothing that I love more than giving the gift of food! I find it difficult to find the perfect gift and when I can make something that is tasty and fun instead of buying something off the shelves it makes me that much happier. 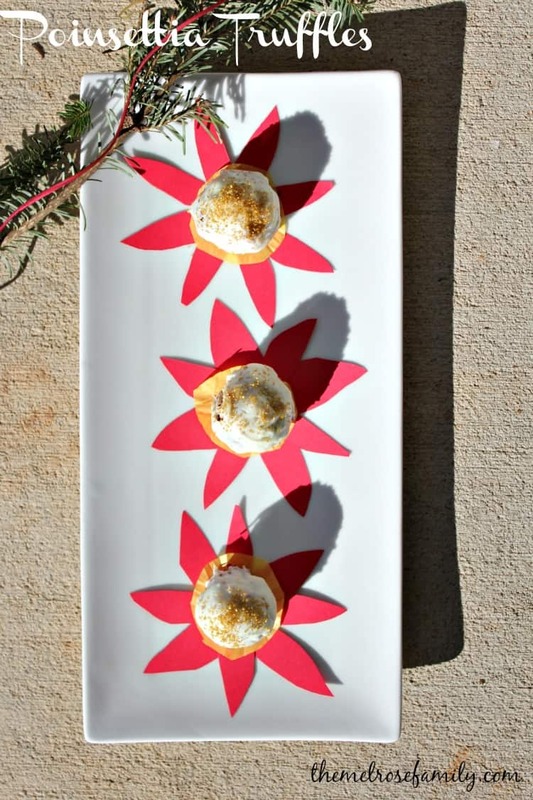 These Poinsettia Truffles are the perfect gift idea to bring a smile to anyone’s face. 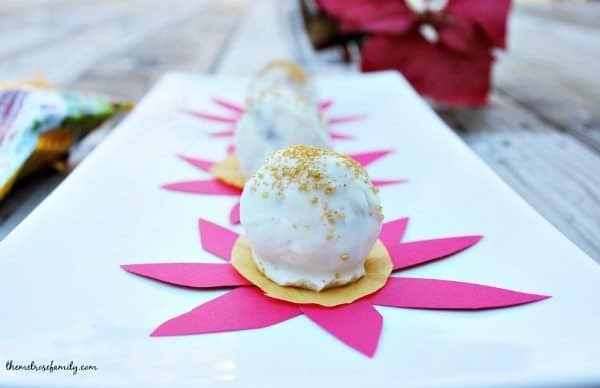 Our Poinsettia Truffles are red velvet filled with NESTLÉ® TOLL HOUSE Holiday Morsels truffles covered in NESTLÉ® TOLL HOUSE Premier White Chocolate Morsels. They are so rich and moist that they are the perfect indulgent dessert for an adult. Plus, they are tons of fun for the kids because of the NESTLÉ® TOLL HOUSE Holiday Morsels. My girls loved biting in and finding the fun Christmas colors. The addition of the gold sprinkles was the perfect finishing touch to add to the truffles to make them look like just like poinsettias. 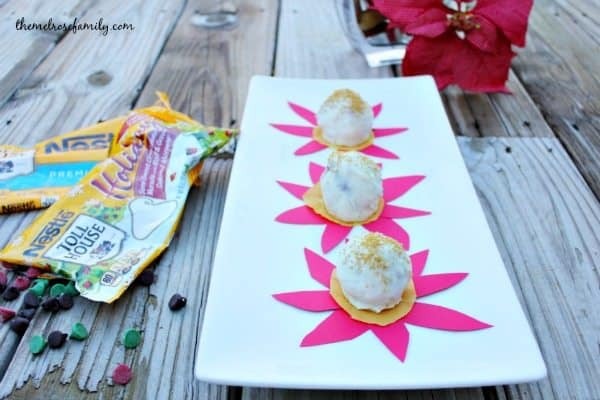 Plus, they were easy for my girls to dust on to the truffles after they were rolled in the NESTLÉ® TOLL HOUSE Premier White Chocolate Morsels. The finishing touch was placing them on top of the poinsettia cut out, which was just red cardstock cut to have four petals on each one. So each truffle holder had two cut outs of the poinsettia leaves that intersected that I simply glued down. 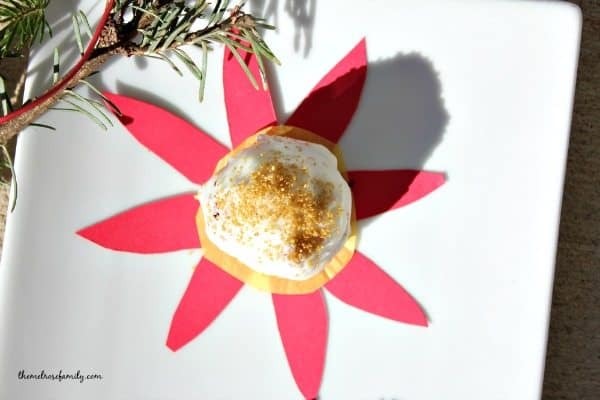 I then glued down a round piece of yellow tissue paper onto the center of each poinsettia that I then set the truffle onto. You can find more holiday baking inspiration on Pinterest and Facebook. 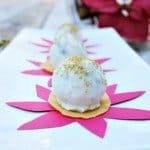 Red Velvet cake truffles filled with holiday morsels and covered in white chocolate morsels are the perfect holiday candy. Bake the red velvet cake mix according to the box directions in a 9 x 11 baking dish and let cool. Crumble the cake with your hands and combine the 2 tablespoons of vanilla frosting to the cake and mix well. Add in 1/2 a bag of NESTLÉ® TOLL HOUSE Holiday Morsels and mix well. Roll the cake and frosting mixture into balls and chill in the refrigerator so that it will be easier to roll them in the white chocolate. Melt the NESTLÉ® TOLL HOUSE Premier White Chocolate Morsels in the microwave or on a double broiler. Roll the cake balls in the white chocolate until they are covered. Set on parchment paper and sprinkle with gold sprinkles. Allow the chocolate to harden and place on top of the poinsettia cut outs.